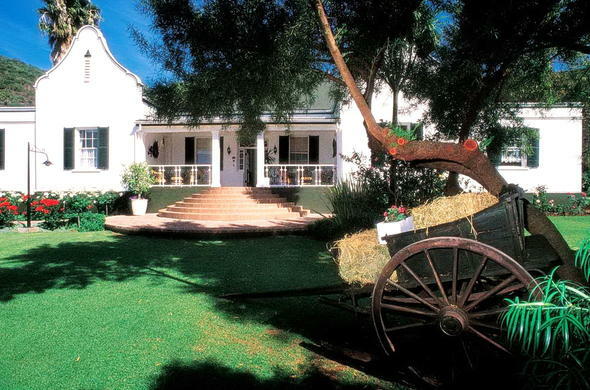 Altes Landhaus Country Lodge is a charming Cape Dutch farmhouse, appointed with beautiful antique furniture, set on a working Ostrich farm near Oudtshoorn. Altes Landhaus Country Lodge is situated on a working Ostrich farm in the tranquil Schoemanshoek Valley, 12km from Oudtshoorn. The lodge boasts luxury en suite bedrooms of great charm. The homestead was built a hundred years ago, and served as rectory to the local church from the 1950's. Heinz and Helen Meyer bought the farm in 1994, endeavouring to restore its historic splendour. Antique furnishings and tasteful decor ring true to the homestead's Victorian past, while oregon pine floorboards and high-beamed ceilings reflect its rustic surroundings. Country cooking is a real treat at Altes Landhaus Country Lodge, with generous farm breakfasts and delicious dinners, complemented by a superb wine list. With great care and dedication, they have recreated an elegant tribute to colonial country living. Leisurely walks around the scenic grounds provide many opportunity to admire the indigenous birdlife. The world-famous Cango Caves are only 10 minutes away. Explore the spectacular Swartberg and Meiringspoort passes and take several scenic day trips to the charming villages of Prince Albert and De Rust.